Portuguese forward Cristiano Ronaldo is building out his fashion empire, with a new line of boots from Nike paying homage to his career, and the second launch from his CR7 footwear range. Nike will release seven Mercurial CR7 boots dedicated to Ronaldo, similar to the Mercurial Superfly CR7 range the player already wears. The boots will chart Ronaldo's rise from his local club Nacional da Madeira to all-time leading scorer for Real Madrid and Portugal. The series kicks off with Savage Beauty, a boot decorated with flames inspired by Madeira, the volcanic island where Ronaldo grew up. Nike described the lava-inspired print as its most intricate design, produced in collaboration with its Italy-based artisans. 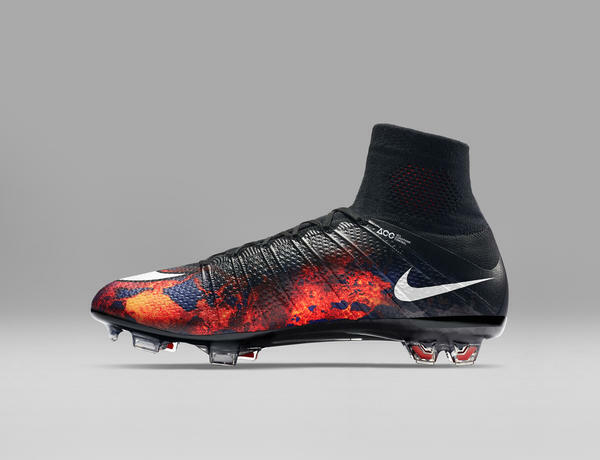 Initially, the boots will only be available through Nike's Football App later this month. The brand is making the collection accessible to non-footballing types with accompanying apparel and street footwear. The second set of boots will arrive in 2016. The release coincides with a new campaign for Ronaldo's second CR7 luxury footwear collection, produced in partnership with Portugal Footwear. The first collection, unveiled this summer, originally included sports shoes - but sponsor Nike reportedly threatened to break ties with Ronaldo unless he withdrew his trainers. It appears there are no issues this time round, though it isn't clear whether Ronaldo needed prior approval for this new collection. Ronaldo said he planned a long future for the growing CR7 brand, which currently include underwear, socks and shirts. He said: "Most important is to continue working on all my brands, developing the designs and exploring all the possibilities with products, production, creative elements. "I like to push myself on the pitch so also apply this approach to my professional life. There’s so much to learn about the fashion industry, and I want to continue the success of my brands.